Cleaning the quinoa on the “shores” of what might have once been Ancient Atlantis. Relaxing amongst the quinoa of Atlantis. 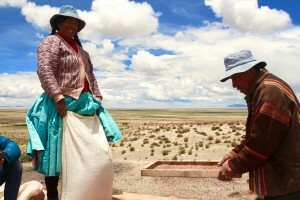 Antisuyo, is closely connected to Lake Poopo and the Uyuni Salt Flats. 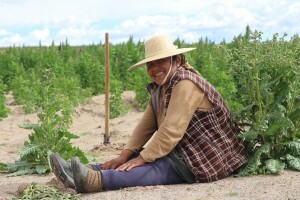 It is also the site of some of Quillacas’ most robust quinoa farming. Here’s photos of the ancient city mountain and the encroaching flood waters of Poopo. Was there a time when the altiplano was fully flooded and Pampa Aullagas was the place of the ancient civilizations of gods? There are many stories of floods in the altiplano, legends about the fights of the gods, volcanoes, and the settling of the mysterious salt flat region – home to the Royal Quinoa, which according to legend, was first brought to that region by angels long ago.